Judge Michael Bohlander (Germany), the international Co-Investigating Judge. 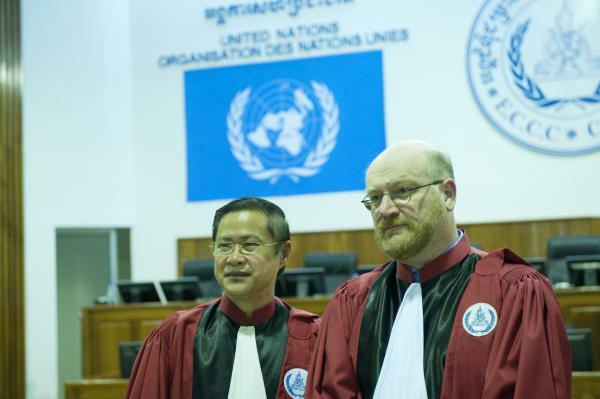 There are currently four cases under investigation, commonly known as Cases 003 , 004, 004/01, and 004/02 involving alleged war crimes, crimes against humanity and genocide, as well as crimes under national Cambodian law. There are major differences between the procedure before the ECCC, especially in the investigation stage, and that before the other International Tribunals, which tend to draw on the experience of common law systems. At the ECCC, following the approach of Cambodian law which uses the French model of the investigating judge (juge d’instruction), the pre-trial investigations are carried out not by the Prosecution and the Defence but by the two Co-Investigating Judges. whether the person under investigation is to be indicted and sent to trial, or whether the case against them should be dismissed. conduct the investigation under confidentiality in order to protect the rights and interests of the Parties, especially the presumption of innocence, to allow for potential protective measures for the identity of witnesses and victims, and to conduct an efficient and effective investigation. Anyone taking part in the investigations is bound by confidentiality and all documents and material included in the so-called case file are confidential, even if a document as such may be public record. The Co-Investigating Judges may from time to time provide the public with a minimum amount of information as long as the confidentiality of the investigation is not impaired. The Co-Prosecutors, of their own motion or at the request of one of the Parties, will conduct a preliminary investigation in order to determine if there is evidence showing that crimes within the jurisdiction of the ECCC may have been committed, and to identify potential suspects and witnesses. If the Co-Prosecutors have reasons to believe that crimes within the jurisdiction of the ECCC have been committed, they will send a so-called Introductory Submission to the Co-Investigating Judges which lists the facts, the alleged offences, the applicable law and – if already known – the name(s) of the person(s) to be investigated. The Prosecution may also file so-called Supplementary Submissions, if new facts come to light that require an amendment of or additions to the original allegations. The Co-Investigating Judges investigate the facts set out in the Introductory and Supplementary Submissions. They must not investigate new facts, unless they have first received a Supplementary Submission to that effect from the Co-Prosecutors. The Co-Investigating Judges have the power to charge any person against whom there is clear and consistent evidence indicating that such person may be criminally responsible for the commission of a crime referred to in an Introductory Submission or a Supplementary Submission. During the investigation, the Co-Prosecutors, Charged Persons and Civil Parties may request the Co-Investigating Judges to consider making specific orders or undertake investigative actions that they consider necessary for the conduct of the investigation. When the Co-Investigating Judges consider that an investigation has been concluded they notify the parties who then have fifteen days to request further investigative action. Once this period has expired, been waived, the requested investigative actions been performed or any appeals against their refusal heard by the Pre-Trial Chamber, the Co-Investigating Judges shall forward the case file to the Co-Prosecutors, who shall issue a written final submission. In their final submission the Co-Prosecutors may request the Co-Investigating Judges to either indict the Charged Person or to dismiss the case. The Co-Investigating Judges are not bound by the Co-Prosecutors’ submissions. They will conclude the investigation by issuing a Closing Order either in the form of an indictment or dismissing the case. The Co-Prosecutors, the Accused and Civil Parties must be notified of the Closing Order. An indictment is subject to appeal only by the Co-Prosecutors, and by the Accused only on the distinct issue of personal jurisdiction. A dismissal order is subject to appeal by the Co-Prosecutors and Civil Parties, by the latter, however, only if the Co-Prosecutors have appealed. If no appeal is filed against a Closing Order, the Greffier of the Co-Investigating Judges shall forward the case file to the Greffier of the Trial Chamber to allow a date for trial to be set, or to the Office of Administration for archiving in the case of a dismissal order. From this moment on, the Co-Investigating Judges are functus officio, i.e. they do not play any further role in the case. However, when new evidence becomes available after a Dismissal Order has come into force, the judicial investigation may be re-opened by the Co-Investigating Judges at the initiative of the Co-Prosecutors.